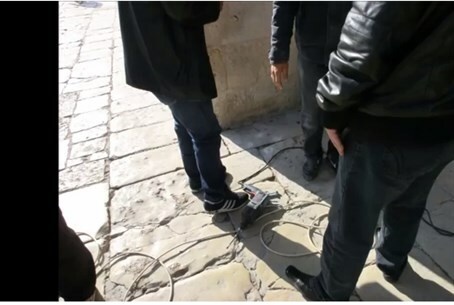 Temple Mount activist catches Waqf officials vandalizing Judaism's holiest site. Muslim worshippers don't just have more freedom to pray on the Temple Mount, a recent investigation reveals: they apparently also have permission to drill. An investigation Monday by Yehuda Glick, Director of the Haliba organization for Jewish freedom on the Temple Mount, caught Waqf officials red-handed in the act of drilling through the ancient stones. Vandalizing the Mount - Judaism's holiest site and a national landmark for people of all religions - violates the law; when caught in the act on film, the perpetrators quickly tried to conceal their actions. The Waqf is the Jordanian-run Islamic trust which administers the Temple Mount. It has been accused on numerous occasions of mounting a concerted campaign to "Islamize" the site by destroying ancient Jewish artifacts. Glick spoke to Arutz Sheva about the revelation and about the special session of the Knesset Committee for the Interior Wednesday regarding the ineffectiveness of Israeli law enforcement system in light of recent events at the Temple Mount compound. Glick said that on Monday, during his daily visit, he noticed a group of Waqf officials drilling with heavy machinery at the site. Needless to say, such an act is supposed be performed only after obtaining permission from the authorities and in the presence of a government inspector. "They saw me coming and immediately tried to hide. It set off warning bells for me and I started filming straight away," Glick recalled. "They tried to hide, and then shouted to the policeman who was there that I could not take pictures without their permission. The policeman ignored them." Glick stated that the Waqf officials were using a drill bit measuring over a meter long to drill through the stones, potentially causing serious damage to artifacts buried underneath. "This is in contempt of the law," he lamented. Glick sees this incident - as well as many others - as prime evidence that the only response to the destruction of antiquities at the Mount, and the Waqf's flagrant violations of the law, is to open the Mount to Jewish visitors for all hours of the day. He compares the situation to that of a mashgiach (kashrut supervisor) at a kosher restaurant overseeing the handiwork of a kitchen worker, whose sole aim is to purposely make the food unfit (not kosher) for its Jewish customers. Similarly, Glick stated, the Israeli police cannot be everywhere at once - as current events indicate - and the Waqf uses the opportunity to purposely vandalize Judaism's holiest site. The purpose of such activities is not only to cause damage in the short-term, but also to damage Judaism's inherent claims to the site by destroying evidence of the ancient Jews there, Glick says. The Mount is frequently closed to Jewish visitors and is often the site of anti-Jewish discrimination. Jews are prevented from praying or performing any other religious rituals, while Muslim visitors pray freely. Muslim anger over the site has escalated since MKs have announced efforts to equalize prayer rights at the site, through legislation which would allow full religious freedom.